One in ten internet users have gone to a dating website. About one in ten (11%) internet users who responded to our survey said they had ever gone to a dating website where they could meet people online.13 That represents about 16 million people. Looking exclusively at the current target population for these services, we find that 37% of internet users who say they are both single and currently looking to meet a romantic partner have gone to a dating website, which represents about 4 million people. Online daters are generally younger and more likely to be employed. Looking across age groups, the youngest cohort (18-29 years old) has the largest percentage of online daters within it, with 18% of all online adults in that age group visiting a dating site. However, 11% of online adults ages 30-49 have ventured to dating sites, while 6% of those ages 50-64 and a mere 3% of those aged 65 and older have tried dating sites. Online daters are more likely to be employed than non-daters, but they are not necessarily garnering huge salaries. Those earning lower incomes are slightly more likely to be online daters. Much of this discrepancy may be explained by the general youth of online daters, who have not necessarily entered their prime earning years. Possibly due to the relatively small sample size, there are no statistically significant differences in online dating use across race and ethnicity categories or education levels. Some of those who have used online dating websites are now officially “off the market.” Of the 16 million American adults who have ever used online dating websites, about one quarter (23%) are now married or living as married. Still, the majority (45%) of those who have visited the sites have never been married. Three in ten (31%) online daters were married but are now divorced, separated or widowed. 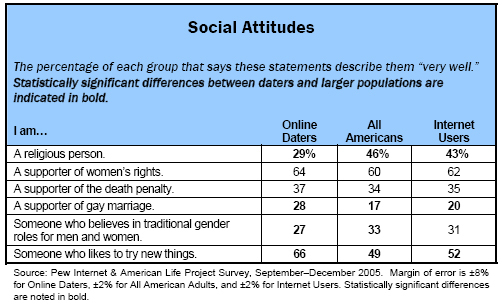 The following table gives the basic percentages of which online Americans use online dating sites. However, even among the singles who have ventured to online dating sites recently or in the past, some are currently unavailable. Of the single people who have used online dating sites (never married, separated, divorced, or widowed), nearly one-third (31%) are currently in a committed romantic relationship—65% are not. This ratio of involved vs. unattached singles is similar to what we find in the overall population of online singles. Of the currently married people who have used online dating sites, the vast majority of them were married in the past 10 years, with nearly two-thirds (64%) married sometime in the past three years. When we asked the single online daters whether or not they were currently looking for a partner, roughly half said they were looking for a new romantic relationship and about half said they currently were not. 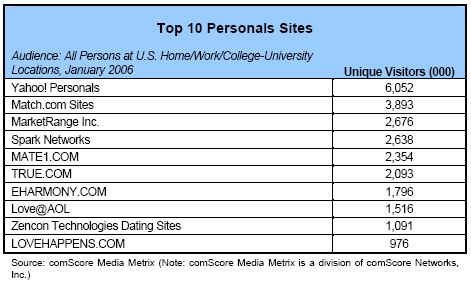 A majority of online daters report good experiences with the sites. The survey shows that many online daters appear to be successful in meeting people online. A sizable segment of those who use online dating websites (43%) have actually followed through with a date, and 17% say their online romances have resulted in a long-term relationship or marriage. Most daters report that online dating is a pretty good experience. Just over half of online daters report that they had a mostly positive experience with online dating websites—52% reported a mostly positive experience, while 29% said it was mostly negative, 7% said it was both positive and negative, and 12% were not sure. Dating sites Yahoo and Match.com win the hearts of most users. Those who have used dating websites are more likely to describe themselves as supporters of gay marriage and identify as “someone who likes to try new things” when compared with the general population of adults and all internet users. They are less likely to identify themselves as religious and are less likely to say they believe in traditional gender roles for men and women. 31% of all American adults say they know someone who has used a dating website. While most Americans do not have firsthand experience with online dating, close to one in three adults know someone else who has tried the services. Internet users are in somewhat closer proximity to online dating; 38% of them know someone who has used online personals. Among those who are single and looking, 44% report knowing an online dater. Of course, online daters themselves are the most likely to know others who have used online dating services; 74% know someone else who uses online dating services. However, that still means that 26% are forging their own path in online dating, without others leading the way. 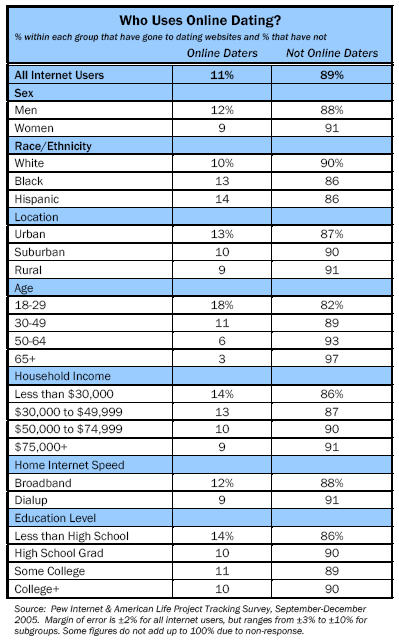 51% of those with broadband all around them—those with high-speed access at home and work —know someone who has used a dating website. 52% of seeking singles who live in areas where it is difficult to meet people say they know someone who has tried online dating. While equal numbers of urban, suburban and rural internet users have tried online dating websites, adults who live in urban communities are more likely than those who live in suburban or rural areas to say that they know someone who has used an online dating website; 35% of urban adults know an online dater, compared with 30% of suburban adults and 26% of rural adults. 26% of American adults say they know someone who has gone on a date with someone they met through a personals site. 37% of those who are single and looking report knowing someone who has gone on a date after meeting that person on a dating site. 46% of those with broadband at home and work know someone who has followed through with a date. 64% of online daters know someone else who has gone on a date with someone they met online. 15% of American adults and 43% of online daters know someone who has found a long-term partner online. One in six adult Americans (15%) say they know someone who has been in a long-term relationship or married someone they met online. Again, certain subgroups are even more likely to know someone who has eventually ended up with a long-term partnership that began at an online dating site. 23% of those who are single and looking report knowing someone who began a long-term relationship online. 25% of those who have broadband at home and work know someone who had a serious relationship that began online. 43% of online daters know someone who has been in a long-term relationship or married a person they met on the internet.